Read about CinemaGIF Pro here. CinemaGIF Live is a Windows application (it might work on Linux and Mac too) that can capture any region of the screen directly into an Animated GIF. You can make short flicks from e.g. YouTube, Vimeo or any internet video provider. You can even create animated GIFs from other animated GIFs. CinemaGIF Pro is be able to capture videos played with the popular media player VLC. 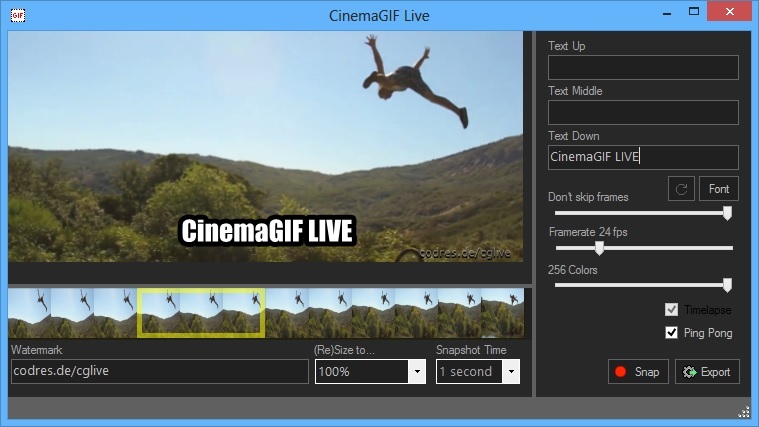 Currently CinemaGIF Live is not for sale and is provided for free, AS IS with no warranty. Please Note: New versions might slightly differ in functionality. Get CinemaGIF Live from here. For a Sample Gallery visit this soup.io page here. They’ll offer you most of the info, and permit one to opt for oneself.